*Cosmetologist, dermatologist, assistant of the Department of Dermatology and Cosmetology, Pacific State Medical University, chief of the clinic “Aesthetic Medicine Studio”, chief freelance cosmetologist of the Primorsky Territory Health Department, member of the European Society of Dermatovenereology , Roszdravnadzor expert on the profile “Cosmetology”. Schonfelds syndrome, also known as autoimmune inflammatory syndrome induced adjuvants (ASIA) was provided by Israeli immunologist Yehuda Schonfeld in 2011 year. It is presumably an autoimmune disease which is induced by adjuvants, in which may act salts of aluminum, silicone, squalene, various vaccine components, and also presumptive many other components possessing immunoreactivity [1, 2, 25]. Adjuvants stimulate immunogenesis through direct effects on the body by means of amplification of the inflammatory and humoral immunity reaction, protein synthesis and nucleic acids, increase the overall immunological reactivity, and through the change of chemical antigen structure, which modifies the antigen by macrophages, capture condition antigen deposition and thereby providing actions on the principle of summation of stimulants. Bomford expressed in 1989 the opinion that the adjuvant effect, especially of aluminum salts, apparently due to the joint manifestation of several mechanisms: preventing rapid dispersion of the antigen from the site of injection and draining it through the lymph nodes; improved antigen-macrophage activation, macrophage activation, which causes stimulation of T-lymphocytes and an increase in lymphocyte retention in the lymph nodes . Schonfeld syndrome has a clinical classification that includes the effects of post vaccination, macrophagic myofascitis, Gulf War syndrome and siliconosis. These diseases ultimately debut manifestations of systemic reactions similar to connective tissue diseases such as vasculitis, systemic lupus, inflammatory myopathy, rheumatoid arthritis, Guillain-Barre narcolepsy syndrome, multiple sclerosis, acute disseminated encephalomyelitis, transverse myelitis, and others [21,26]. As adjuvants currently can act: mineral adjuvants (mineral colloids, soluble compounds, crystalloids); vegetables, microbials, subdivided into corpuscular (BCG and complete Freud adjuvant, C. Parvum, B. Pertussis, Nocardia, L. Monocytogenes), and soluble subunit, cytokines and peptides with the properties of cytokines, preparations of thymic origin, preparations of bone marrow origin, complex artificial adjuvant systems, as well as artificial environment of the organism, mineral oil and guaiacol [8, 14, 20, 27, 28, 30]. Aluminum adjuvants are good immune stimulants used in vaccine preparations. This property is associated with the activation of inflammation of NLRP3 . Aluminum salts induce humoral immunity through Th2 responses, but have less effect on cell-mediated immunity and therefore are not used in vaccines directed against intracellular pathogens [12, 14, 24]. Proven the role of such autoimmune complications provoked aluminum hydroxide as arthritis, diabetes mellitus type I, multiple sclerosis, systemic lupus erythematosus, chronic fatigue syndrome, Gulf War Syndrome, Macrophage myositis, Guillain-Barre syndrome (GBS), Alzheimer’s disease, epileptic status [7, 9, 30]. The connection between silicone and immuno-mediated diseases was recorded in the last century and is one of the cornerstones of ASIA. It has been reported that modern silicone implants lead to increased secretion of C-reactive proteins after surgery and are correlated with pro-inflammatory and aggregation such as antibodies against cardiolipin . Silicone implants should be considered as bioactive implants that are capable of inducing the formation of immunogenic collagen membranes and chronic immune responses through diffusion through a connective tissue capsule. Data on siliconosis and genetic identity are questionable. Patients who developed autoimmune reactions after silicone implants had an increased mutation frequency of HLA-DQA1 * 0102, HLAs DQ2, and DRW53. In contrast, in other studies in Caucasian patients with scleroderma and silicone implants, there was no difference in allele frequencies compared to idiopathic scleroderma . However, in these studies only patients who met the criteria of known autoimmune diseases were involved. They did not consider patients with less specific manifestations that did not fit a particular systemic disease . In favor of the emergence of ASIA in the implantation of silicone implants and the more so the leakage of silicone and its subsequent calcination, the increased titers of rheumatoid factor after 7-13 years after surgery also speaks [28, 16]. Silicone immune reactions are associated with the development of the rejection reaction of the implant and the chronic connective tissue reaction, which initially represents an acute inflammatory response, followed by a chronic fibrosis response . The model of arthritis induced by murine collagen and the model of lupus showed that silicone is responsible for increasing the circulating levels of IL-2 in both models, as well as antibodies against the DNA molecule. Also, silicone implantation after 12 months led to an increase in the incidence and severity of arthritis. In patients with severe immune-mediated responses to silicone implants, it was found that they have an increased level of IgG in the surrounding tissue and in the serum compared to asymptomatic implanted patients . The syndrome of the Persian Gulf War was manifested in the form of vaccination of veterans against the action of paralytic poison and against anthrax many years after the war led to quite serious consequences, which later received its own name – the Gulf War Syndrome. It was first described in 1998 by veterans of war who did not suffer from classical rheumatic diseases, but presented symptoms characteristic of these disorders, such as arthralgia, myalgia, lymphadenopathy, chronic fatigue, and autoimmune thyroid disease. But in 2008, a new study was conducted in New Orleans, in which dosages of serum antibodies against squalene where compared between veterans with the control group and in patients with connective tissue disease . The result was positive in 95% of patients, and 45% showed hypergammaglobulinemia. That is, after more than 10 years, the intensity of immunity persisted [11, 18]. Macrophage myofascitis, is interesting for its well-documented histopathological changes . This pathology has systemic manifestations that include severe asthenia, chronic fatigue, myalgia, arthralgia, fever and, in some cases, demyelinating polyradiculoneuritis, which is clinically similar to Guillain-Barre’s disease with changes in electromyography, genetic susceptibility, since only patients with HLA profile DRB1 * 01 are susceptible to this disease . In a separate aspect, the authors would like to highlight information on the possible role of hyaluronic acid preparations in the development of ASIA syndrome. Recent experiments show that antibodies to DNA cross-react with hyaluronic acid, heparin sulfate and chondroitin sulfate, and are present in patients with systemic lupus. In addition, an elevated level of antibodies to hyaluronic acid correlates with the aggressiveness of the course of the disease. Similar data were found in the blood serum of patients with autoimmune thyroid diseases. That is, there is a direct correlation between the severity of autoimmune diseases of connective tissue and the content of antibodies to glucosamine . Previously it was considered that hyaluronic acid (HA) alone or in combination with acrylic hydrogels (HA-AH) had no serious side effects. However, recent data show that large, local and / or systemic, immediate or delayed adverse effects may occur due to its use. 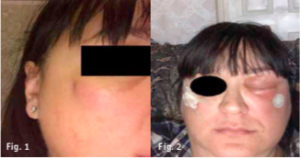 The analysis of patients after administration of hyaluronic acid and hyaluronic acid with acrylic hydrogel was carried out. Out of 25 patients, 15 had manifestations of immunomodulated disorders. The average time of development of symptoms was 13.7 months, and the age factor had a direct correlation. At 30% there were silicone implants, which in the end, according to the authors, led to an accumulation effect . Also, in the study of patients with presumably late-nodule granulomatous nodules, a biopsy showed a chronic inflammatory response, which in some individuals persisted even 11 months after treatment, and in some, a severe granulomatous reaction to hyaluronic acid was detected. Serum analysis showed the presence of antibodies against “Restylane” and / or “Hylaform” in the form of IgA, IgE . Extremely important concepts are long-term security and reversibility of side effects, but to date many authors are inclined to believe that such manifestations are an integral part of the ASIA syndrome [3, 4, 5, 10, 13,]. In the period from 10.10.2016 to 10.10.2017 in the City Clinical Hospital №2 a group of 11 people (8 – female, 3 – male) with similar features with the clinical course of the Schonfeld syndrome was selected and formed. The median age was 43 (32-49) years. Inclusion criteria: history of hypodermic hyaluronic acid and / or other fillers in the past 2 years, absence of clinically confirmed systemic connective tissue diseases, values ​​of the clinical variables under study within the reference values ​​from 6 to 18 months prior to seeking medical help, age less than 50 years, absence for the period of study of acute diseases of different etiology. Patient selection was also based on an analysis of clinical symptoms that included arthralgia of the joints of any anatomical region, myalgia, dermal manifestations such as vasculitis, erythema of the face and décolleté area, unmotivated rise in body temperature above 36.9 degrees, lymphadenopathy, unmotivated fatigue, increased brittleness of the nails and hair. All patients had two or more manifestations of the above reactions. The whole group was quantified by C-reactive protein (CRP), lactate dehydrogenase (LDH), fibrinogen, rheumatoid factor (RF), lupus cells (LE-cells). The results are presented in Table 1 and Table 2. Fig. 1: Right nasolabial soreness and swelling. Fig. 2: Inflammation in left and right zygomaticus areas. For example, we show you the report of one patient. Women K., 48 years old, turned to our clinic in October 2016 with a complaint about edema, erythema, tenderness of palpation in the left zygomatic area. In April of the same year, she got a filler based on hyaluronic acid in the left and right zygomatic regions of 0.8 ml and 0.2 ml in the upper third of the left and right nasolabial zone. After 3-4 weeks, soreness and swelling appeared at the injection site in the region of the right nasolabial fold (fig. 1). The patient herself turned to the surgeon. Biopsy was done and the material was aimed at determining the bacterial culture. It was a sterile, clinical blood test without signs of inflammation. Over the next four months, similar inflammation appeared alternately in the left and right zygomatic areas (fig. 2). Antibacterial therapy was performed once with amoxicillin-clavulonate at a dose of 375 mg twice a day for 7 days – without effect. Then patient went back to cosmetologist. After inspection in the left zygomatic area was an inflammation site of 1.5 x 2 cm, warm to the touch, painful, dense, in the center there was a normotrophic scar 0.5 cm. In the region of the upper third of the nasolabial fold on the left and in the zygomatic area on the right – the normotrophic scar 0.5- 0.6 cm without signs of inflammation. *References values: CRP – <0.5 mg/dL, LDH -1 – 248 U/L, fibrinogen – 1, 6 – 4 g/l, RF – <30 MU/L, ESR – 2 – 15 mm/h. Clinical blood test shown increased WBC to 12*10^9 cells, ESR to 34 mm/h, fibrinogen to 4.6 g\l, RF to 84 Me/L and positive LE-cells. The patient was referred for further examination to the department of Rheumatology, where was diagnosed ASIA. For 14 days of prednisolone therapy, all manifestations were eliminated. Based on the data obtained, we concluded that subcutaneous injections of hyaluronic acid in some cases are capable of leading to the development of systemic reactions of the organism that have similar manifestations with true systemic diseases. The ASIA syndrome at present has many unexplored issues. Nevertheless, there is a sufficient amount of data to believe that many of the earlier known components and substances are able to act as adjuvants, resulting in systemic body reactions. However, the role of adjuvants in the development of true systemic diseases remains controversial. 18. Israel E, Agmon-Levin N, Blank M, Shoenfeld Y. (2009) Adjuvants and autoimmunity. Lupus 18: 1217-25. 19. Israel E, Agmon-Levin N, Blank M and Shoenfeld Y (2011) Macrophagic myofaciitis a vaccine (alum) autoimmune related disease. CRAI 14: 187-9.